In 1807 David Evans, son of James Evans, was born, perhaps here. James Evans lived here from 1823-50. On March 26th 1823 Mary Evans died aged 23. She was the only daughter of James & Margaret Evans. On 1st October 1830 Margaret Evans of Penybanc wrote her will. She referred to her husband James Evans; late brother David Williams of Netpool; Thomas Evans, son; and David Evans, son. She left shares in several ships – the brig ‘Jane’; sloop ‘Hibernia’, sloop ‘Fanny’; brig ‘Fame’; sloop ‘Phoenix’; sloop ‘Hopewell’; and sloop ‘William Skerme’. On 11th April 1831 Margaret Evans, wife of James Evans, died aged 61. In 1835-86 David Evans lived here. In 1835 James Evans, son of David & Margaret Evans, was born. In 1836 Margaret Evans, daughter of David & Margaret Evans, was born. In 1838 Daniel Evans, son of David & Margaret Evans, was born. He lived here until his death in 1919. In 1841 the following persons lived here: James Evans, 60; David Evans, 35, his son, shipwright; Margaret Evans, 40, daughter-in-law; James Evans, 6, grandson; Margaret Evans, 5, grand-daughter; and Daniel Evans, 3, grandson. In 1843 John Evans, son of David & Margaret Evans, was born. He lived here until his death in 1913. 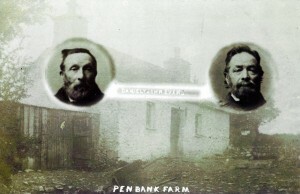 In 1847 Penybanc was owned by Rev. Robert Miles, owner of the Priory estate, and was occupied by David Evans with 24 acres. On March 6th 1850 James Evans died aged 76. In 1851 the occupiers were David Evans, 44, farmer of 24 acres; Margaret Evans, 51, his wife; their sons – James Evans, 16; Daniel Evans, 13; and John Evans, 9; and their daughter – Margaret Evans, 15. In 1861 the following persons lived here: David Evans, 56; Margaret Evans, 61, his wife; James Evans, 26, their son; Margaret Evans, 25, daughter; Daniel Evans, 23, son; and John Evans, 19, son. In 1871 the following persons lived here: David Evans, 63; Margaret Evans, 70, his wife; James Evans, 35, their son; Margaret Evans, 34, daughter; Daniel Evans, 32, son; and John Evans, 22, son. 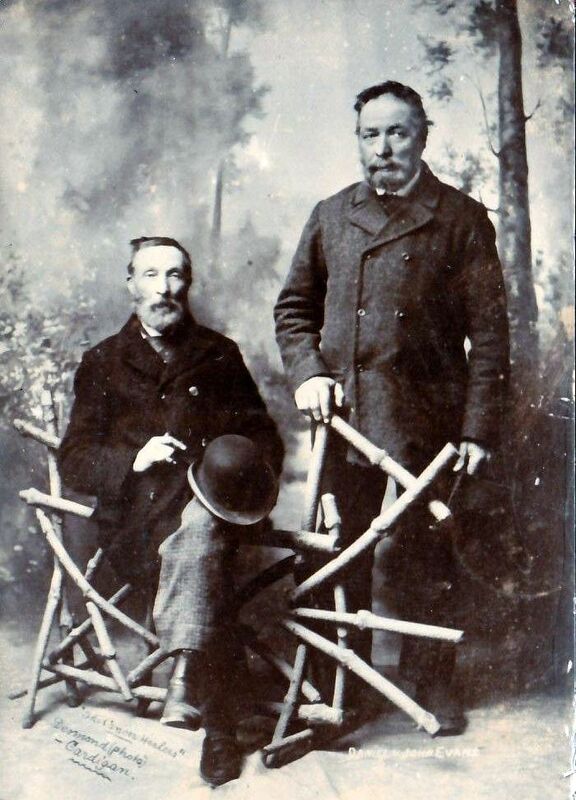 On 14th September 1877 Messrs. Evans of Penybanc launched the smack ‘Margaret’ they had built at Nantyferwig. On October 20th 1880 Margaret Evans, wife of David Evans, died aged 79. In 1881 the following persons lived here: David Evans, 72, ship’s carpenter; James Evans, 44, his son, fisherman; Margaret Evans, 43, daughter, dairy-maid; Daniel Evans, 41, ship’s carpenter; and John Evans, 37, farmer. In 1883 David, Margaret, James, John and Daniel Evans lived here. In 1886 John Evans married the maid, Mary Evans. On August 26th 1886 David Evans died aged 79. In 1891 the following persons lived here: John Evans, 46; Daniel Evans, 50, his brother; and Mary Evans, 25, his wife, servant. In 1892 David Rees Evans was born – the son of John & Mary Evans. John and Daniel Evans were the farmers here in 1895-1913. In 1896 Margaret Mary Evans was born – the daughter of John & Mary Evans. Penybanc was withdrawn from the sale of the Priory estate on July 31st 1897. It was sold in August 1897 with 25 acres to Daniel and John Evans, tenants, for £470. “…For more than twenty years these humble practitioners have been treating all kinds of diseases with ointments and salves made entirely of herbs, but only lately has their fame spread abroad. They originally used their remedies as a side issue only, but for some years now, they have been kept busy visiting their patients. The brothers live unpretentiously, about two miles from Cardigan and every morning walk into town with the preparation of their remedy. They keep no system of books, and have no fixed charges. They have a small surgery where there are a few beds for their worst cases, and where some of the patients are able to come to see them. Here also are a collection of specimens in alcohol. At present there are about 45 persons in Cardigan under treatment – cases of lupus, rodent ulcer, epithelioma, and true scirrhus of the breast. “…NEW CANCER CURE. FAME ACHIEVED BY TWO CARDIGAN FARMERS. For some time past considerable interest has been excited over numerous alleged cures of cancer and other diseases carried out by the use of herbs only by Messrs. John and Daniel Evans, small farmers, residing at Penbank, in the parish of Verwig, near Cardigan. Messrs. Evans are by trade ship carpenters, and are almost self-taught, although their father was a shipwright and owner of sailing trawlers, which the brothers assisted in working, but they subsequently settled down to farming. Brought up in the country, they studied the nature of herbs, gaining Proficiency that they soon became noted in their immediate locality for treatment of sores, &c. As time went on they attended graver cases of disease, and, it is stated, with marked success, until about twenty years ago they gave their attention more especially to external cancer, and their treatment was so highly thought of that by degrees their fame was spread, until at the present time patients come to them from all parts of Wales and from London and other large centres in England. They have received repeated offers to treat patients at their own homes in London, Liverpool, Cardiff, Swansea, Aberystwyth, &c., but they refuse all such offers, as their time is fully occupied at Cardigan, where the number of patients who visit them is very considerable. In reply to a question if they ever received patients from hospitals their reply was, “Yes, several: even from the London, Cardiff, and Swansea hospitals,” and mention was made of one very bad case now under their treatment from the Cardiff Hospital. The patient had had operations on her right breast, under the arm. She left for her home after the operation, and returned to Cardiff again in August. She was then told that her arm would have to be amputated, but to this she would not consent, preferring to return home to die. After leaving the hospital she accidentally met a Mrs. Jenkins, residing at North-road. Cardigan, who was attending the hospital with her child, and it was she who told the sufferer of the Messrs. Evans. About a fortnight afterwards the patient came to Cardigan, where she has been under treatment ever since, and she has so far recovered that she will, it is anticipated, leave Cardigan for her home, cured, in a fortnight. Another case quoted was that of a man from a London hospital who had been treated for cancer, and had been under the Rontgen rays for 10 months, with no result. He came to Cardigan, and a complete cure is declared to have been effected, and at his recommendation another patient, a milk walk owner in London, 80 years of age, who had had cancer for fifteen years and been repeatedly treated at a London hospital, is now under treatment at Cardigan, and, although he has lost a portion of his gums, one lip, and a part of his nose, the herbalists are sanguine of a successful issue. Cases such as this could be largely quoted, and the number is increasing, there being at least 40 patients under treatment at Cardigan from various parts of the country at the present time. If a case is too far gone to be considered hopeless the patient is at once informed, so that no false hopes may be raised. “…The brothers were expected at four, but by three o’clock the room, measuring 9ft by 9ft, was full of waiting folk, and a small crowd which was continually being augmented – some in carts and traps – waited patiently outside. Upon the table in one corner of the room were numerous glass bottles filled with cancers that had been brought away from the suffering patients at various times. They were all of the same type, namely thick crusts such as could be obtained from any skin surface, even the healthiest. “…a month ago my wife attended a specialist who has performed many successful operations for cancer, and he not only pronounced her to be suffering from this disease in both breasts, but stated that an operation would be inadvisable, as her case was too far advanced: thus holding out no hope of recovery. At this time my wife had the greatest difficulty in breathing, the pressure on the lungs in consequence of the disease, being so great. And the specialist could suggest no remedy for relieving it. In April 1911 G. M. Dawkin of Pontypridd wrote an article in the local press attacking the brothers and their “quack” cure. John Evans died on 15th May 1913 aged 70 after a long illness. On 16th July 1916 Private John Evans of Penybanc was wounded in France. On 22nd June 1918 John Evans, son of the late John Evans of Penybanc, died of gassing on active service, at the age of 23. Daniel Evans died on September 20th 1919 aged 81, and was interred at Ferwig Church. In 1924 Mrs. Mary Evans, Daniel Rees Evans, and the Misses Margaret Mary Evans and Ellen Evans occupied Penybanc. Mrs. Mary Evans was still the farmer in 1926. Mary Evans died in 1932. The property was probably abandoned at about that time and is now a ruin. I had the pleasure of hearing this remarkable account directly from the late David Rees Evans at his home in Lansdale, Pennsylvania, about fifteen years ago. His account, to my ability to remember it, was consistent with what is written here. I remember thinking at that time, and feel the same today, that a great treasure to mankind was allowed to slip beneath the waters of history while popular medical technology rambles on hell-bent to cut, to drug and to radiate. Thanks George. Wow – very interested to hear that you had spoken to David Rees Evans – was he the son of the David Rees Evans in the account – the David Rees Evans mentioned above was born in 1892 and died in, I think, 1957 or thereabouts. I’d love to know if there are any living descendants. Even the most hardened sceptic must agree that something interesting was going on in Cardigan during the early years of the 20th Century, and, even if it turned out to be co-incidence, quackery or exaggeration, the medical authorities should have investigated what might possibly have been an effective form of treatment for external cancers. Delighted to hear from you. Andrew’s father was a hero of Bomber Command who flew the Handley-Page Halifax during WW II and held the distinctive Distinguished Flying Cross. Andrew is married to my wife’s sister, Judy, and is one of the finest men I have ever known. Hello Glen, yes indeed there are many living descendants. I’m the grandson of David, Great grandson to the brothers Evans. Please see the following video and book for more information. It’s a story that should be told. Thank you for providing this wealth of information. Hi Rob – I have a much-treasured copy of ‘Cancer-Curers, Or Quacks’ which was co-authored by my old English teacher – Dafydd Wyn Jones. Unfortunately I’ll be without internet from later on today for six weeks while my house is being renovated, but I’d like to get in touch after that for an exchange of information – I find the Penybanc Evans’ a fascinating family! What a fascinating little documentary – highly recommended to anyone with an interest in the Cardigan Cancer Cure. Many thanks for the link!